A grow light is a type of electronic lamp designed to accelerate plant growth by emitting electromagnetic spectrum ideal for photosynthesis. LED grow lights make use of LED technology for illumination. The LED grow light market is analyzed by different product types, range of light spectrum emitted by them, and on the basis of new or retrofit type of installation. The application segments considered for market estimation of LED grow light include indoor farming, commercial greenhouses, vertical farming, turf & landscaping, and research purposes. The LED grow light has different power that differed according to application. For example the commercial greenhouse, vertical farming, and indoor farming uses high power LED whereas the turf and landscaping application requires the low watt LED for decoration of gardens and hotels. The LED grow light is costly compared to other grow light technology hence their usage was restricted to the application where urban farming is done with large scale. But with the advancement in technology and awareness about its energy efficiency compared to other lighting technology adoption has increased rapidly. The destruction of lighting according to plants need and low heat generation is the some of the benefit of LED grow light. It used in may application among them commercial application held the largest share value $170.66 Million in 2014 and expected to grow with CAGR 26.19% from 2015 to 2020. This research study segments the LED grow light market on the basis of different types of products, installation type, spectrum, applications, and geographies. It also provides revenue forecast, and analyses trends in the market. The geographical analysis contains an in-depth classification for North America, Europe, APAC and Rest of the World and highlights some of the major countries/regions from all these geographies. The sections and the sub-segments in the report contain drivers, restraints, opportunities, current market trends, and the technologies expected to revolutionize the LED grow light domain. The report also provides comprehensive profiles of various companies, active in these markets. Moreover, it includes a competitive Landscape of the key players in the LED grow light market with detailed market ranking analysis, mergers and acquisitions, collaborations, partnerships, new product developments, and the key growth strategies of each player. This report categorizes the global LED grow light market on the basis of product, spectrum, installation type, application, and geography. It also covers some of the emerging technologies and trends in this market. On the basis of product type, the market is segmented into low power product (<300watt) and high power product (>300watt). The LED grow light market, based on spectrum, is segmented into laser partial spectrum and full spectrum. The LED grow light market, based on installation type, is segmented into new installation, and retrofit. The LED grow light market, based on applications is broadly segmented into indoor farming, commercial greenhouse, vertical farming, turf & landscaping, research, and others. The geographic analysis covers the North America, Europe, Asia-Pacific, and Rest of the World (RoW). The cross segmentation data included in the report gives a deep insight about the regional markets. The agriculture market is on the transition path from using traditional lighting technology to new lighting technology such as Light-Emitting Diode (LED) grow light. The traditional lighting, such as incandescent lamps, halogens, and fluorescent lighting, is witnessing decline due to consumers’ awareness of LED grow light technology. This trend is being seen more in Europe and the North America, whereas the APAC region is showing the highest growth in the use of LED grow light in urban farming. Also, the Rest of the World (RoW) region, especially in Middle East, commercial greenhouse trend has increased, which is ultimately driving the LED grow light business in the country. 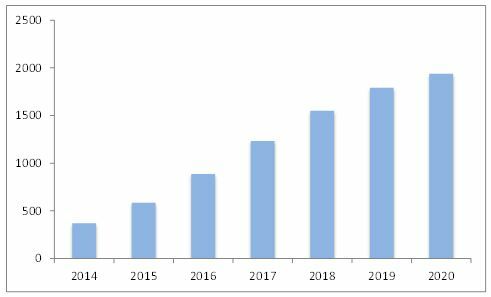 The LED grow light market is expected to rise to more than $1.9 Billion by 2020, growing at a Compound Annual Growth Rate (CAGR) of 26.93% between 2015 and 2020. The traditional lighting can be used for the growth of a plant, but the high energy wasted with this lighting technology has restraints that force users to switch to LED grow light. Also, the governments from developed countries and regions such as the U.S. and Europe have been stringently passing resolutions in banning incandescent bulbs and supporting the adoption of efficient and eco-friendly technologies such as LED. For instance, The European Commission has planned to phase out halogen lamps from European Union by 2018. The LED grow light is an emerging technology with high growth potential in several applications including, indoor farming, commercial greenhouse, vertical farming, turf and landscaping, and research among other applications. Vertical farming is the fastest growing application, whereas commercial greenhouse holds the largest share among all applications for the LED grow light market. The need for energy-efficient light and long-lasting technology increased the use of LED grow light in these applications. LEDs have a long life of 50,000 hours, while incandescent lamps can work for only 2,000 hours. LEDs can last for nearly 8–10 years assuming 14–18 hours of daily use. LEDs consume 50% and 85% lesser electricity than fluorescent lamps and incandescent lights, respectively. Hence, due to these benefits, market is increasing in urban farming. In this report, drivers, restraints, opportunities, and challenges for the LED grow light market have been covered. Major driving factors for this market are rising trend of indoor farming, government initiatives and mandates, long life and low energy consumption, and efficient and robust design of LED for better productivity. The figure given below shows the estimated growth of the LED grow light market between 2014 and 2020. In the LED grow light market, the commercial greenhouse application has captured the majority of the market share; however, vertical farming is the fastest growing applications during the forecast period. Some of the major players in this market are Alta LED Corporation (U.S.), Bridgelux, Inc. (U.S.), Cree, Inc. (U.S.), Everlight Electronics Co. Ltd. (Taiwan), General Electric Company (U.S.), Heliospectra AB (Sweden), Illumitex, Inc. (U.S.), Lumigrow, Inc. (U.S.), Osram Licht AG (Germany), and Royal Philips Electronics N.V. (Netherlands). Geographically, this market covers North America, Asia-Pacific (APAC), Europe, and RoW. 13.2 Royal Philips Electronics N.V.
13.8 Everlight Electronics Co. Ltd.